You don't have to use toxic food dyes to color your Easter Eggs. Check out these 7 ways to Dye Easter Eggs Naturally. You probably already have the ingredients in your kitchen. People have been decorating eggs for at least 5,000 years. Eggs decorated in gold and silver have been found in ancient tombs around the world. For Christians, decorated eggs were initially a symbol of the empty tomb of Jesus. In later years, they were decorated in ways to acknowledge the sacrifice Jesus made on the behalf of believers. Fast forward to modern times and eggs have become showcases for anything from Star Wars to Frozen. It's time to take Easter back. Eggs are finally off the hook as being a food that should be limited. Hard boiled eggs are a great source of protein and essential fats and vitamins. Easter is the perfect time to encourage your child to develop a taste for hard boiled eggs as a snack, as breakfast or in a sandwich. Decorating your eggs is a first step. However, the store-bought egg decorating kits might not be you first choice if health is foremost in your mind. I'm sure if you've ever dyed Easter eggs, you've noticed that the dye is not confined to the outer shell. The food coloring and dyes leach through the shell to the egg inside. But never fear! There are plenty of ways to make fun Easter eggs with things you most likely have in your kitchen. Mix one cup of purple grape juice with one tablespoon of white vinegar. Let eggs soak for 15-20 minutes. Cut a medium beet into six parts and add one cup of boiling water and 1 tablespoon of vinegar. Let sit for 30 minutes. Soak eggs for 15-20 minutes. Chop the tops of 6-10 carrots and simmer in 1 ½ cups of water for 15 minutes. Add three tablespoons of vinegar. Soak eggs for 15-20 minutes. 2 tablespoons of turmeric and 1 cup of boiling water and one tablespoon vinegar. Use the skins of 6-8 red onions and simmer for 15 minutes in two cups of water. Let cool for 15 minutes and add 3 tablespoons of vinegar. Cut up a ¼ head of red (yes, red) cabbage and simmer in four cups of boiling water. Add 2 tablespoons of vinegar before dying eggs. Once eggs are colored and dried, use a drop or two of olive or coconut oil rubbed in with a paper towel or your hands to shine them up and show them off. Wrap rubber bands around eggs to get a white string pattern when dying. Use a white crayon or a piece of wax to add initials, smiley faces or designs to eggs. Make new color combinations by dipping eggs in different colors. And, don't forget you can always add stickers, googly eyes, pipe cleaner legs/arms/ears to give your eggs a fun feeling. 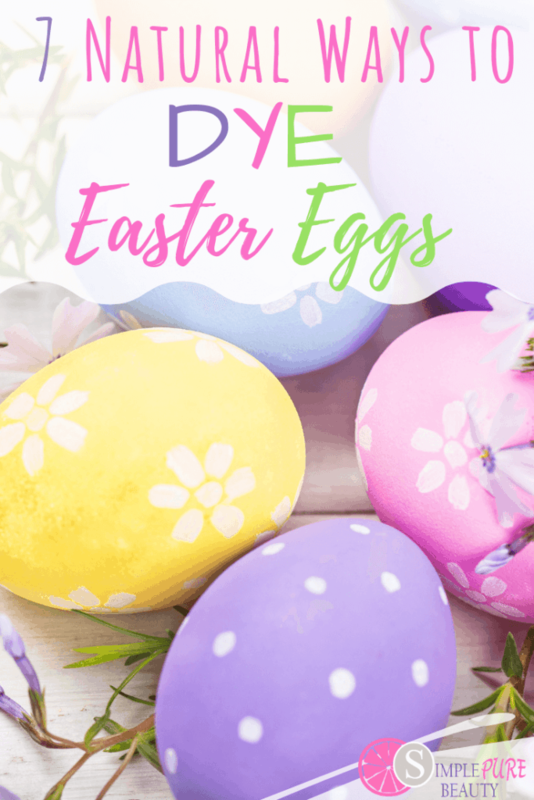 Have you dyed Easter Eggs naturally? What are your favorite tricks?